Ruby on Rails is a Web application framework, not just a CMS. Still, Handy Backup can save Ruby server data, as well as work with any Ruby on Rails CMS, e.g. BrowserCMS, Radiant, Refinery CMS and other. All operations for backup Ruby projects are made automatically. Ruby gem called Backup is the perfect backup instrument for backup Ruby data. Main problems of this tool are high specialization (for backing up Ruby data only) and a need to create cron job (under Linux, of course!) for scheduling Rails backup effectively. Traditional bash scripts for Unix-like systems or Windows batch files used for backing up Ruby on Rails website content or projects are demanding to skill and experience of users. Again, it is often a need to use external scheduling for automating Rails backup by this way. Effective Automation: Using Handy Backup! As Ruby on Rails content consists of typical server data, Handy Backup has a capability to save all Ruby information without a help from Ruby gem. It can ensure Rails backup database, download Ruby on Rails website statics and quickly restore all this data when the need will emerge. 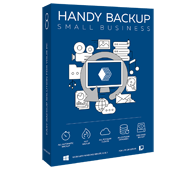 To backup Ruby server data, as well as any Ruby on Rails CMS, please use the Handy Backup Small Server edition. Free 30-days trial version! If you want to create a backup automating task allowing both Rails DB backup and saving static files from your Ruby instance, please follow the next instruction. Open Handy Backup. 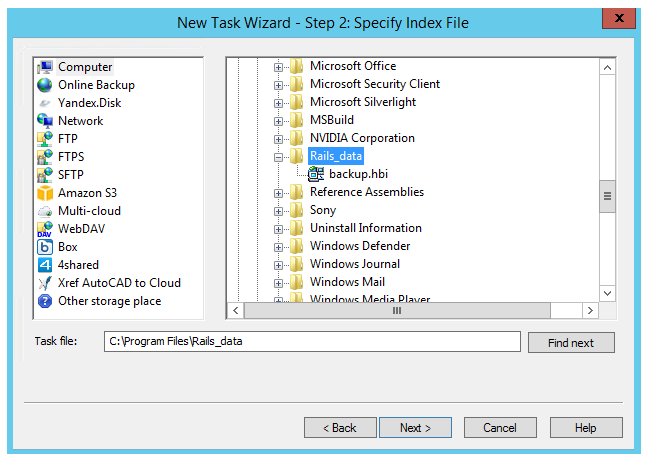 Call a task creation wizard by pressing Ctrl+N or by using some “New task” control (the button or the menu item). Select a backup task on the Step 1. Connect to your Ruby via FTP, SFTP or FTPS on the Step 2. 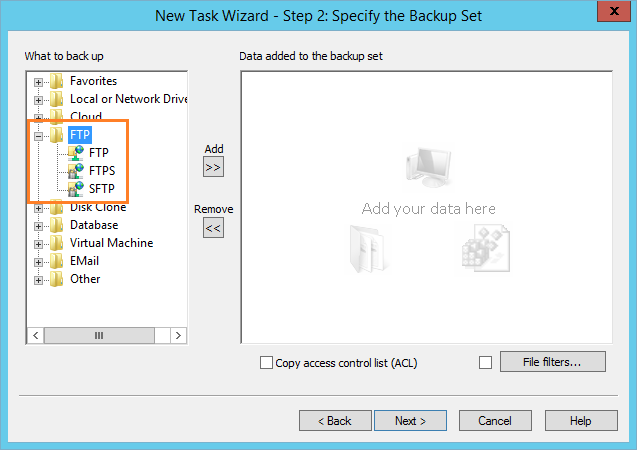 To do it, select an appropriate data source, add it to the backup list, and then set up the connection using a "New configuration" option on the data source window. You will see the list of data available via your connection. Mark data you plan to backup with checkboxes. Press OK and return to data source selection. Now it is the time to configure Rails database backup. Select “MySQL” (or other database option, for custom Rails builds), and, again, set up a new connection to the database engine. Select database components for backing up by marking the checkboxes. Return to the data source selection (Step 2). On Step 3 select the storage for your Rails backups. The list of available storage devices and services is enough to stare at it. Not bother to select the storage type most satisfying you with your personal or business backup strategy! All next steps are automating backup task. You can select a backup type, schedule your task and compress or encrypt your data. Many extra options will help you ensure the backup result will be exactly what you want. Please read the User Manual about task creation steps! Give your task a name and finish the process of creation. Your Ruby on Rails backup task is ready to perform automatic job! Start it by scheduling (see Step 6), or run it manually when you need. To restore data from backed up Rails DB or Ruby-powered website, create a restoration task using the same method as for backup task. You can use restoration tasks for copying or mirroring your content; to do it, just select a new destination on the Step 3 of your restoration task. You can also use Ruby on Rails data just from backup folders, unless these data were encrypted. By default, Handy Backup stores copies of files without any changes in native format, allowing using any software traditionally working with these data formats to process data just from backups. To backup website information, please do the sequence of actions according to the following video. What can be more illustrative than personal experience? Try Ruby backup just now, downloading the latest version of this solution for a completely free 30-days trial!